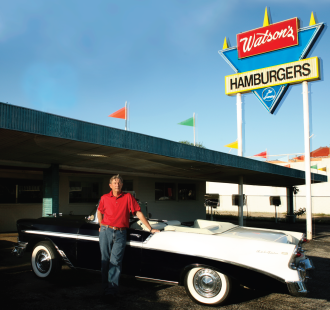 When the newly restyled Chevrolet Bel Air arrived in showrooms it was an instant success. More than 1.5 million 1956 Bel Airs were produced, making it a remarkable success and one of the most recognizable American cars of all time. 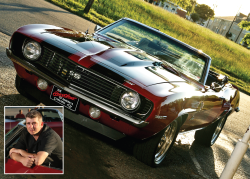 Denison’s Milton McAllister was 13 years old, but in his memory the Bel Air’s graceful front and rear wheel openings, full-width grille, and single housed taillight, stoplight, and backup light gave it just as good a look going, as coming. Priced at just under $2,500 (plus tt&l) only 41,000 convertibles were built making one a rare find today. A frame-off restoration of one of these classics will fetch $80,000 at auction. Of course, the real value is in owning and driving a car that brings your heart and spirit back to earlier days. 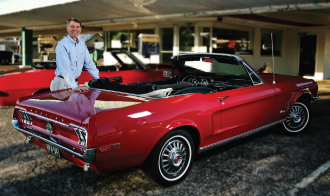 This ‘68 Mustang is the exact same car given to Richard by his father when he was a freshman at SMU. Just 17 miles southeast of Sherman on US 69 and SH 11 in extreme east Grayson County, Whitewright is a prototypical Texas town with one foot in the past and the other firmly planted in the here-and-now. Settlers from Kentucky established the area in the late 1800s. Whitewright was a land rich for cultivation and cattle, a wilderness of grasses, flowers and forest.